Head of State Control Committee couldn't control his excitement at the site where his forefathers served G-d.
MK Amnon Cohen (Shas), Chairman of the Knesset's State Control Committee, couldn't control his excitement Sunday when he visited ancient Shilo, the site where his forefathers served G-d for hundreds of years. 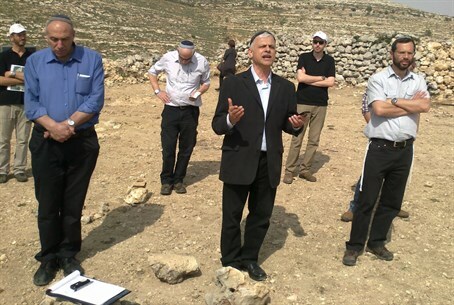 He immediately requested that the tour of the site – which dealt with municipal matters – be stopped, and led other MKs in a fervent afternoon mincha prayer. The Uzbekistan-born MK Cohen is, like virtually all Jews named Cohen, a direct patrilineal descendant of the priestly families that served as kohanim, or priests, at the Holy Temples of Jerusalem, for about 1,000 years. The Temple was G-d's Sanctuary, and the place where Israelites from all over the Land of Israel and the world came to offer their tribute to the Creator. The priests – both Kohanim and Levites, were the ones in charge of running the Temple's services, receiving the offerings brought by the people and carrying out the sacrifices. Before King Shlomo (Solomon) built the first Temple in Jerusalem, G-d's Sanctuary was a smaller structure, which stood in Shilo for over 350 years, according to tradition. After the prayer, MK Cohen conferred the Priestly Blessing upon all those present – including MK Orit Struk (Jewish Home), whose idea it was to hold the tour, and MK Motti Yogev, also of the Jewish Home, as well as the Head of the Binyamin Regional Council, Avi Roeh.